GSDS | Spring 2017 DOW Diversity Lecture, Malika Jeffries-EL: Taking the road less traveled: My journey to the Ivory Tower. Spring 2017 DOW Diversity Lecture, Malika Jeffries-EL: Taking the road less traveled: My journey to the Ivory Tower. 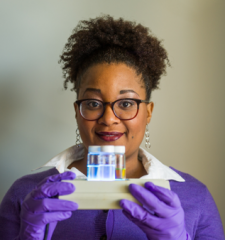 Although African-Americans make up approximately 13% of the US population, they are severely underrepresented in advanced degrees awarded in STEM disciplines and within the ranks of the faculty at research institutions. Despite the overwhelming statistics, Professor. Jeffries-EL managed to find her way into the Ivory Tower. A native of Brooklyn, NY she lived in public housing and attended public school. Although her situation was less than ideal, she always had a passion for science that her parents encouraged her to pursue. In this talk, se will discuss what excites her about science along with current trends in degree attainment, academic hiring, pipeline issues and potential solutions woven within the content of her personal experiences.